Please help us grow our network by volunteering for support groups. Jump to: Introduction Types of Therapy What Animals are Used Effectiveness Enhancement or Replacement? Animal-assisted therapy (AAT) is a form of therapy that uses animals and/or pets as a component of therapy or rehabilitation. 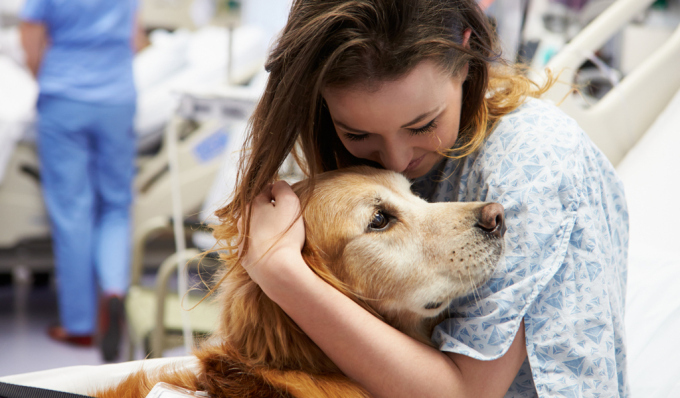 Used in a variety of settings, including pediatric care, mental institutions, and prison systems, animal-assisted therapy is also used with prevalence in substance abuse rehabilitation programs. Per the Annals of Long-Term Care, AAT actually has its roots as far back as the 1800s when Florence Nightingale discovered that animals reduced anxiety in mental patients and children. Two-thirds of all households in the United States own pets. And pet owners will be the first to tell you how beneficial their pets can be to their lives – making them feel happy when they are sad and also giving them something to look forward to when coming home. Humans are drawn to animals in general – with some saying that they have a “healing power” of sorts. Pets make their owners feel needed, wanted, and loved. Physically, pets have been known to lower blood pressure, help people deal with life stress (e.g., a divorce, death), and help individuals relax. In fact, research has shown that just being around animals releases the “feel good” hormone oxytocin within our brain which leads to happier and more loving actions and thoughts. The American Counseling Association has reported that animal-assisted therapy is beneficial because it helps individuals who are in rehab treatment get the most out of therapy. Some individuals in rehab may be more withdrawn or angry that they are in rehab to begin with. Animals can help rehab patients come out of their shells, so to speak – participate more in rehab activities, and get them talking to counselors more openly. Also, animal-assisted therapy gives rehab patients a new focus – something to keep their mind off of drugs and/or alcohol and gives them a purpose or responsibility. What Types of Therapy are Animal-Assisted Therapy Used For? 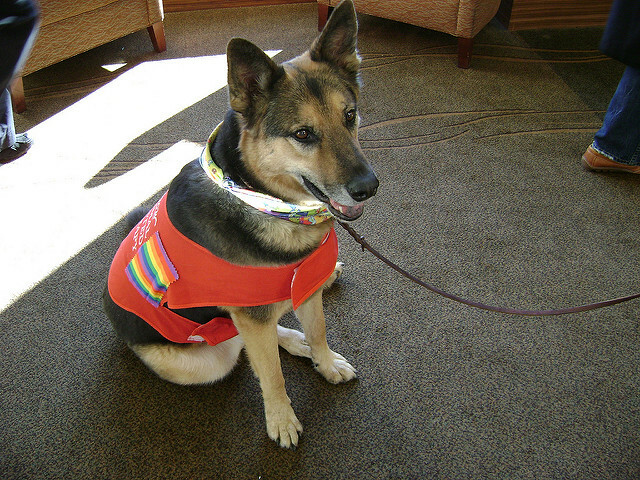 As stated above, animal-assisted therapy has been used in a variety of settings. Research has found it be very beneficial in pediatric care – to help children open up during therapy sessions – especially for children who have been abused or who have suffered some type of trauma. Additionally, animal-assisted therapy has been helpful in prison populations. In these settings, prisoners are exposed to animals to relax them, teach them how to diminish feelings of hostility around others, to enhance behavioral and cognitive well-being, and to lower stress. 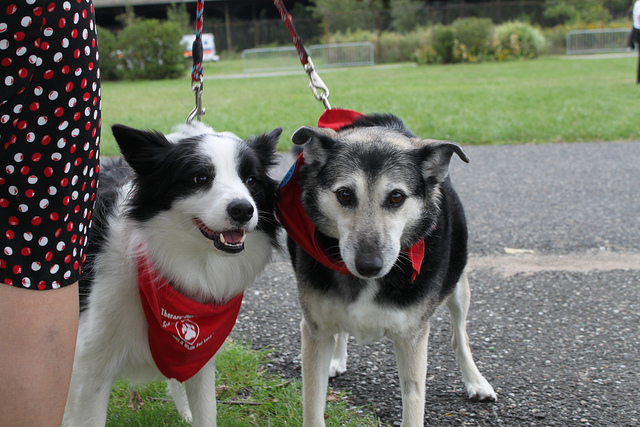 The introduction of animals into nursing homes has provided the elderly with a renewed sense of well-being, livelihood, and engagement – helping patients stay active and giving them something to look forward to. Animal-assisted therapy has also been specifically beneficial for dementia patients – giving them hands-on interactions with a warm body, teaching them how to feel a heartbeat, allowing them to pet soft fur, and to show emotions and affection. For substance abuse rehab facilities, AAT has been an effective mode of treatment, allowing recovering addicts to open up, feel relaxed in therapy sessions, and take their mind off the environmental triggers that have played a large role in abusing drugs or alcohol. Animals are a “distraction” of sorts – taking the mind off the seriousness of the situation and providing companionship in times when the addicts might feel the most lonely. Pet Therapy – pet therapy involves pet owners taking their well-trained and well-behaved pets to different settings to allow patients, students, etc. to interact with the animal. Just being around the animal helps to lower blood pressure. Animal-assisted Therapy (AAT) – AAT is incorporated into the therapy session such that the animals are used for counseling purposes. They are part of the treatment program itself, not just there for a quick visit to lower anxiety and hostility. .
What are the Most Common Types of Animal Assisted Therapy? When conducting animal-assisted therapy, what types of animals are typically used? While a number of animals can be used in theory (even hamsters, fish, and gerbils), the three most common types of animals used for AAT are dolphins, dogs, and horses. For substance abuse rehab treatment and recovery, dolphins are not the go-to animal. In therapy settings, dolphins are often used for people who are not fully functioning in some type of mental or physical capacity – for example, autism, cerebral palsy, Down Syndrome patients. 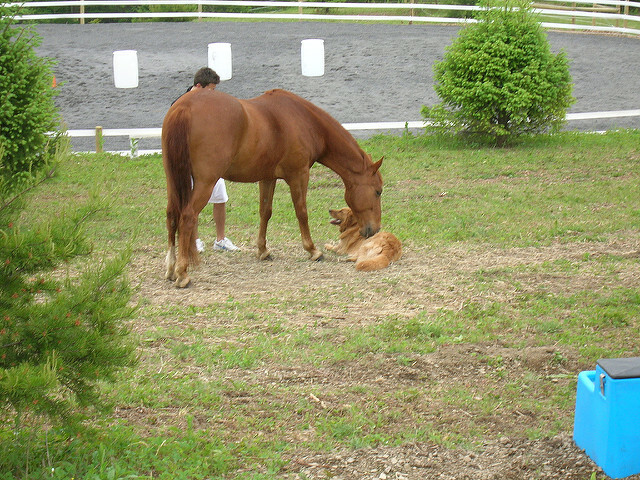 However, equine therapy and canine therapy are used often in AAT within substance abuse programs. Horses are mirrors to ourselves – they respond based on what they see us do – so they are very beneficial in learning about relationships and coping with different situations. And it’s often through these interactions that therapists and counselors can understand how drug addicts respond to situations. While the statistics are almost non-existent, the benefits of animal-assisted therapy are easy to see. Though it’s important to note that animal-assisted therapy’s effectiveness has a lot to do with if the person likes animals to begin with. Those who do not like animals are probably not going to benefit as much with animal-assisted therapy procedures. Those who do love animals will likely respond well to treatment and recovery with AAT built into it. One of the key things that animal-assisted therapy can help with is elevating the rehab participant’s mood. Animals typically increase positive moods among individuals. And positive moods have a direct effect on the effectiveness of treatment and recovery programs. Therefore, if animals can raise an individual’s mood, treatment potential is enhanced. Should it Replace Regular Therapy? How effective is using animals in therapy sessions? Should this be a major method to treatment or an enhancement. At this stage of animal-assisted therapy, this therapy should be used as a supplement to regular counseling, group therapy, and one-on-one therapy sessions. 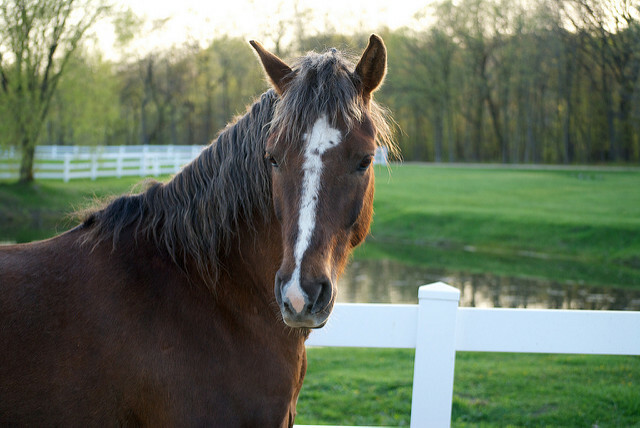 Similar to how a 12-step program is beneficial after release from rehab, canine or equine therapy is beneficial during regularly scheduled counseling session or therapy treatments. Substance abuse addicts in particular still need the daily cognitive reasoning skills and cognitive behavioral skill set that teaches them how to cope with everyday life stressors. While the research literature is still blooming in this area, what we do know is that animals can have profound effects on our moods and our bodies, which is turn can have profound effects on our treatment and recovery success.